Laser Light Therapy is an effective and safe cosmetic treatment that is applicable for treating many symptoms of an aging skin. However, its application is a bit limited when treating deep scars like acne scars or pronounced wrinkles. Thus, people contemplating laser treatments should know about similar treatments and alternatives to Laser Light Therapy. Intense Pulsed Light, or IPL treatment, is a preferred cosmetic treatment within the niche of non-invasive, non-laser treatments. Instead of laser beams, IPL uses a controlled form of broad-spectrum light. There is a definite reason that makes non-laser treatments like Intense Pulsed Light more potent and cost-effective than laser light therapy. Lasers emit a coherent light. This essentially means that the laser beams are synchronized and within the range of wavelength, with most beams being identical in terms of their ability to penetrate the skin. Non-laser devices used in IPL are capable of producing a broad spectrum of wavelengths. Thus, light used in IPL treatment can combine minimal and greater penetration during the same session for different areas on the skin. For improving the overall precision of IPL treatment, special filters are used, which also ensures that potentially-damaging wavelengths are effectively controlled. IPL treatment is more suited for defined spider veins, facial flushing or inflammation related to rosacea, increased pigmentation and age spots rather than treating light wrinkles. It is also used for removing facial hair and numbing the activity of overactive hair follicles that often lead to repeated bacterial infections. Due to greater precision associated with IPL, different forms of IPL are used for treating different skin conditions. For instance, the PhotoDerm VL treatment is used for treating vascular lesions and dark-colored birthmarks on the face. PhotoDerm PL is used for treating pigmented lesions, including all kinds of age spots and freckles. Such specialized use of laser beams is not seen in Laser Light Therapy. Infrared laser treatment is very similar to the non-ablative form of Laser Light Therapy. Just like the laser beams, infrared beams used in this treatment are able to seep through the epidermis and heat the internal, dermal layer. Just like laser-induced heating in Laser Light Therapy, dermal heating through infrared waves yields immediate and long-term results. The overall precision and penetrative capabilities of laser and infrared light treatments don’t present significant differences. Though infrared cosmetic treatments are used for eradicating fine lines and wrinkles, they are more commonly used for acne treatment (acne scar removal) and reducing symptoms of sebaceous hyperplasia. Though skin tightening in the long term is associated with infrared treatment, the collagen formation may not be as enhanced as found in laser light treatment. 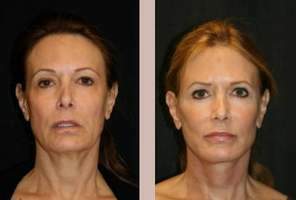 However, a contemporary variation of infrared light treatments, called Titan, has a remarkably increased ability to treat fine lines and is often advertised as a non-invasive facelift treatment. As compared to laser light therapy, the ability of infrared light to subdue the overactive sebaceous glands responsible for repeated bouts of acne is more notable. In terms of treating skin damaged by exposure to sunlight, laser light therapies are generally regarded a bit more effective since sun-damaged skin needs some degree of superficial treatment for more noticeable results.